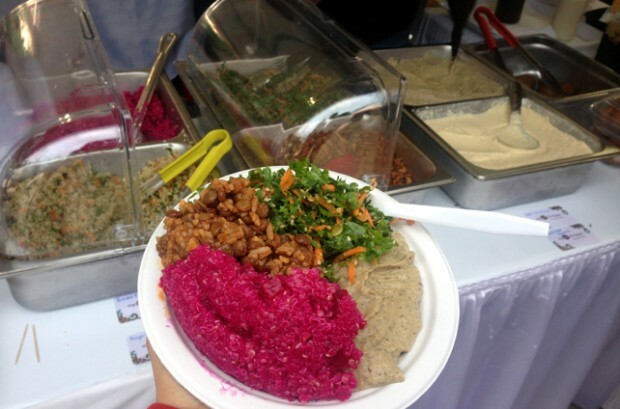 I was at the Toronto Vegetarian Food Festival this past weekend, and while being surrounded by vegan food is amazing, it is also incredibly tempting because it’s all fair game. When you’re going to a food festival after lunch, the healthiest thing to do is to make some smart food choices up until you get there! Take a look at my food-day. I planned to indulge a little at the festival and keep my usual healthy meals the rest of the day. So it includes clean fruits and veggies and then the smart and not-so-smart indulgences I had once I arrived at the Toronto VegFest. This is my Vegan MOFO #8. It’s What-I-Ate Wednesday! 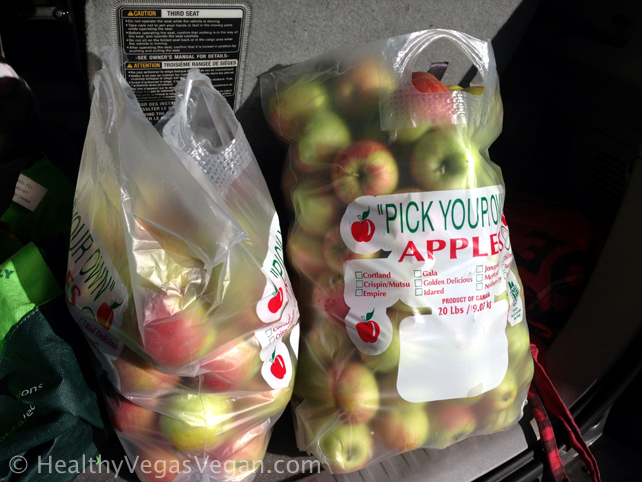 But before even heading to the festival, we were running out of fruit, so I made a trip to a nearby apple orchard to get some reinforcements, in bulk! Papaya for breakfast = yummy. I’ve been eating melons for breakfast a lot lately. This morning, I decided to go for a delicious ripe papaya. I saved the seeds to experiment with a salad dressing later – they have a really peppery flavor. We were going apple picking, so I ate it in the car on the way. 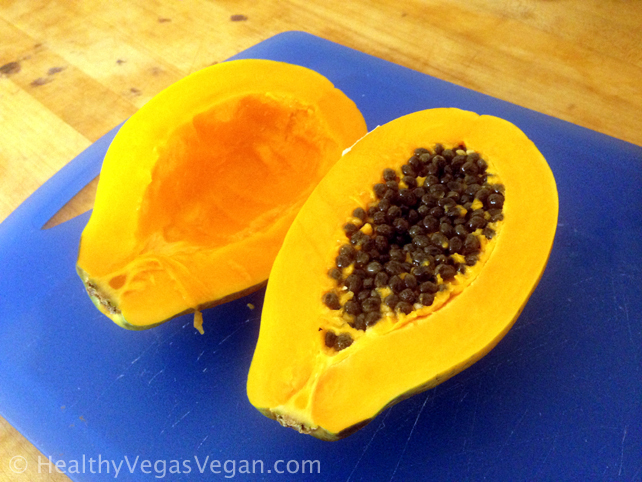 Easy to do – just cut in half, remove seeds, and bring a spoon. Then you can just scoop out the flesh and eat it as you go, just like a melon. Love picking fruit – in this case, it’s apples. The bag on the right is ours – we pack it full! One huge bag of honeycrisp apples for $25. It’s heavy so it’s gotta be less than $1/lb. Unfortunately, Toronto farmland is being bought up to turn into housing developments. 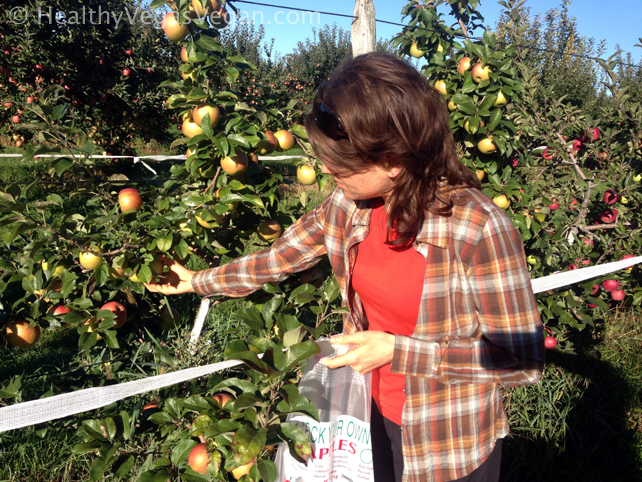 Every year, there are less orchards and u-pick farms to choose from. We took advantage of one that still does exist, and picked a few bags (between four of us). These will be my main fruit-calorie source for the next week or so. I’ve already blended lots into smoothies – in addition to eating them raw, of course. Looking forward to some raw applesauce (only lightly blended so it still has some texture). Of course, I chowed down on some apples while picking them, too. We got back with just enough time to make a smoothie with my new apples before heading out for the VegFest. We were in a rush to make the keynote presentation, and we knew we had an hour long subway ride to get there. I had only my purse so wanted to travel light. Aka, no bulky containers of green smoothie that I would have to store later. Bring on the burst of inspiration! My on-the-fly brainstorm session came up with using a ziploc bag that could fold up flat in my purse afterwards. The logistics of eating out of it, especially getting to the stuff toward the end, was tricky, but it tasted great and packed away beautifully. To avoid plastic, you could use a reusable bag. I just didn’t have one on hand in my uncle’s house where we are staying. The downside? 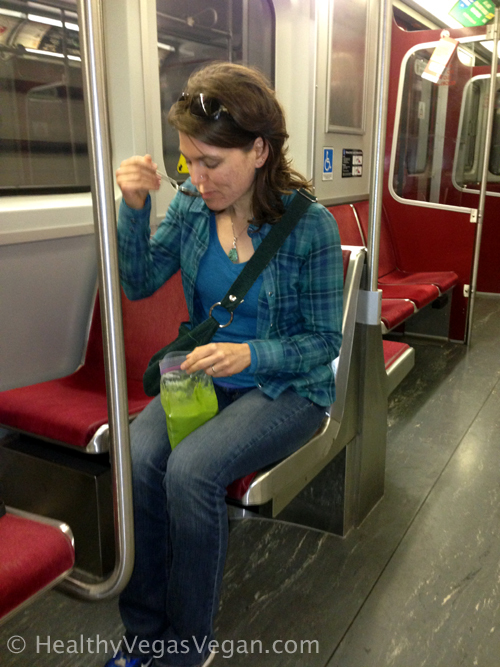 People may look at you funny on the crowded subway car when you are spooning green goo into your mouth out of a plastic bag. Actually, I think people are so used to NOT paying attention to anyone else, that they barely noticed me. I tried not to care anyways and focused on my delicious lunch! 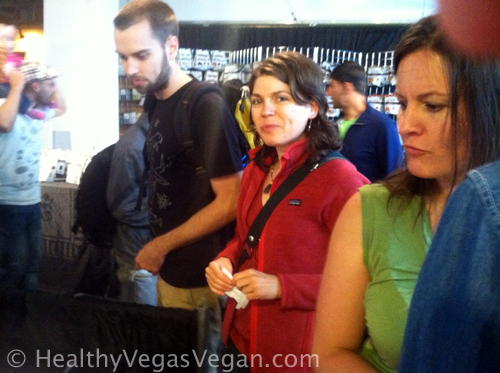 Caught in the act eating some samples from the Vegfest vendors. 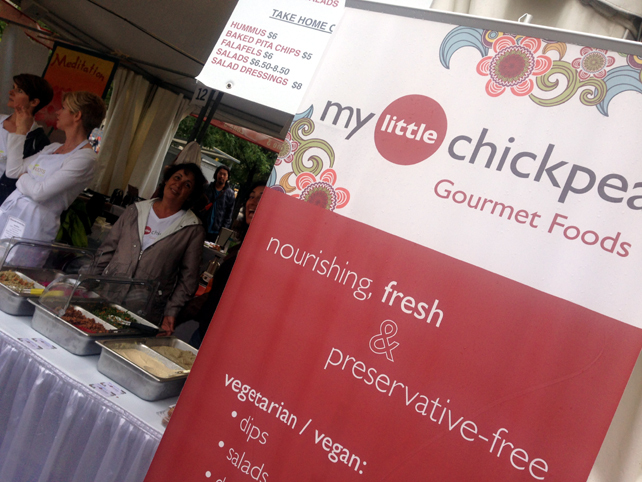 The samples… Let me tell you… Being at a vegetarian FOOD festival definitely has its perks. The first day, I was so excited to zoom around trying all the samples (and yes sneakily going back for seconds). I was high on the fact that I could actually eat everything that was there. Everything I saw was vegan – because usually when we label events “Vegetarian” we really mean “Vegan but non-threatening”. First off, you know from reading my blog that in my everyday life, I eat pretty much exclusively whole vegan foods. I eat tons of fresh fruits and veggies, and then maybe steam a couple sweet potatoes or cook up some lentils. We never have any flour or soy products in the house and snacks are apples and carrot sticks. So when I say that I let loose with samples, it was exciting little indulgences. Here’s why you shouldn’t stress too much about something like this: it was a limited time frame, they were tiny toothpick-sized goodies, and they were all vegan. Actually, now that I think about it, most of my snacks weren’t all that “bad” and were in fact the same “healthy” stuff I used to eat regularly before I went high raw. Ezekiel bread, field roast sausage, dark chocolate, raw macaroons, flax crackers with pesto, quinoa amaranth porridge. But then there were a few things that I would never eat that I gave myself permission for: tiny pieces of bagel, mock oreos, daiya cream cheese on crackers. 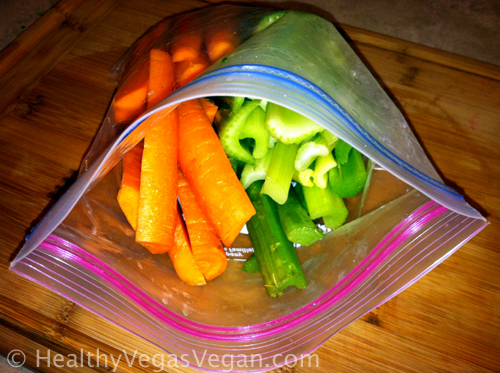 Carrot and celery sticks I cut up before leaving and kept in my purse for the day. Fresh veggies like carrots and celery help cut the grease and icky feel of eating junkfood vegan splurges. A perfect balance between indulging and still feeling good. One thing I did notice was that most of the food for purchase was pretty unhealthy. Being vegan doesn’t change that. A lot of it was beige food without much in the way of fresh color, often fried or made from flour or processed soy. And I’m not saying that’s a bad thing for occasional consumption; I’m just saying that there wasn’t too much I wanted to eat more than a simple taste of. There were tons of stands for vegan bakeries and lots of booths selling ethnic foods (Indian, Asian, and Mediterranean were the most common). Also a few raw food tents. But still rarely a fresh food to be found. And I was really craving something fresh so I learned my lesson and just brought my own fresh foods. Then when I ate a meal purchased there (or just enough snacks to equal a meal) I felt a whole lot better. When it came down to eating dinner, there were tons of vendors selling incredible vegan food. The bottom line was, however, that a lot lot of it was junkfood vegan fare. That’s okay for samples, but I wanted to be really satisfied and still feel amazing after my dinner. Bought a sample plate from this Mediterranean-style vendor. So, I made a few circles and scoped out the cleanest choice I could find. It ended up being a Mediterranean place called My Little Chickpea (cute, huh?). It was a toss up between this and a raw collard wrap from another vendor. But the wrap was nut-pate filled (e.g. high-fat raw), and it was a cold, rainy day so this just seemed more satisfying. 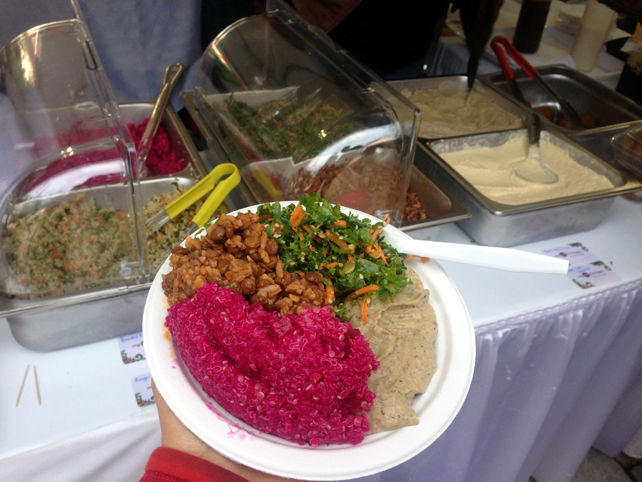 Sample platter: babaganoush, kale salad, curried lentils, and beet quinoa. I got a sampler platter with Babaganoush (oh my gosh good), Orange Ginger Raw Kale Salad, Spiced Lentils and Rice, and Roasted-Beet Quinoa. Remember that raw is not always the healthiest choice. Sometimes some cooked quinoa or lentils are your best best. And what do you think, of all the baked goods, fake meats, and gourmet raw snacks, that I actually purchased to take home? Some probiotic cultured cabbage, aka sauerkraut! 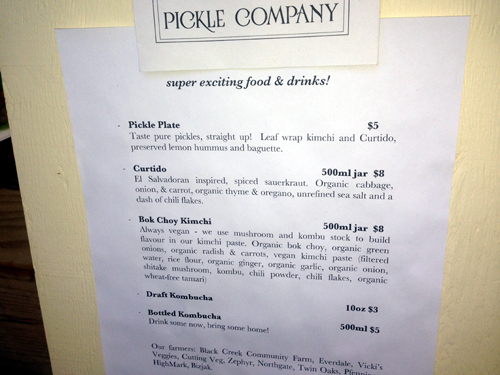 Love the name Alchemy Pickle Company. 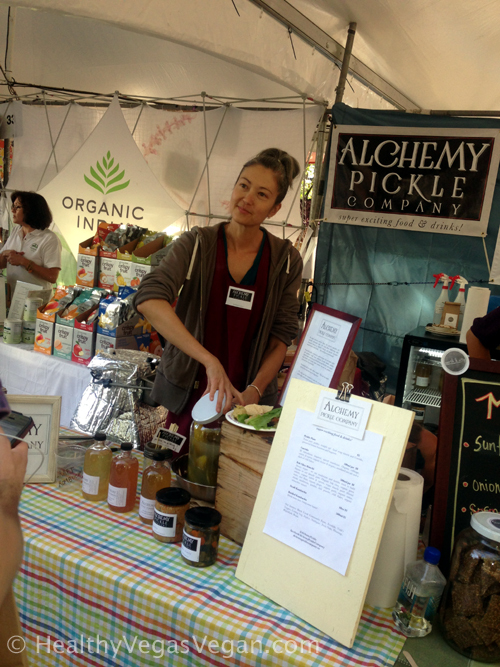 And love the probiotic-rich fare this lovely lady creates. Can you believe they had kombucha on tap? They had the whole kombucha jug there and just poured you out some fresh brewed kombucha from the spigot. Reminded me of home and made me miss my own SCOBY. To learn more about making kombucha from scratch (and what it is), read my article I’ve Got a Kombucha Baby in My Oven! I got some homemade Curtido, an El Salvadorian fermented cabbage, similar to sauerkraut but with a little spice to it. I tried samples of both this one and her vegan kimchi. I was tempted to get the kimchi because it’s hard to find vegan and sugar-free. But, I was won over by her Curtido, and I love to try new things. This has already featured itself as a pre-dinner digestion starter in my meals. Strangely enough, it also worked really well as a side to plain, air-popped popcorn. Go figure. 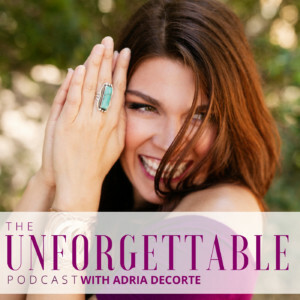 Hopefully this has given you some tips for how to balance indulging at events and staying healthy to boot! The two don’t have to be mutually exclusive. I find that when I’m surrounded by new, interesting food, what I really want is just a taste. That’s where samples come in. Or eating off others’ plates – preferably people you know…Then, when it comes to a real meal, go for something you know will leave you feeling good. Now your turn. 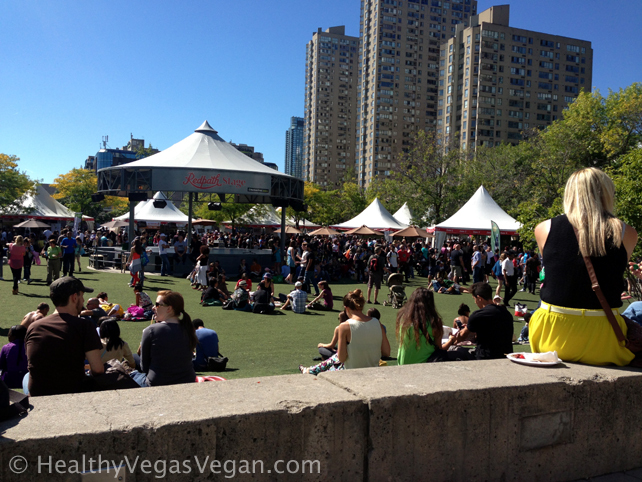 Been to any cool vegan-friendly events lately? What did you eat? Leave it in the comments. This is another What I Ate Wednesday. I just spent a week in Portland, Oregon and I did much better this trip than I have in prior ones with my out of town eating. Unlike you, I did not keep my portions to the sample or bite sized and I brought some things home. The bakeries up there are incredible. However, I was on vacation and I did a great deal of walking along with the eating. Ay, there’s definitely something to be said for walking around a city while you are traveling. It certainly helps balance out any overindulging we do! It’s also easy to rack up the miles when you are exploring – a couple of nights ago, when I was walking in Toronto, I ended up going 7 miles before realizing it!